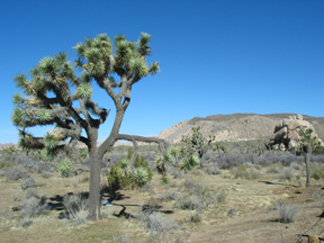 A Joshua tree grows in the foreground of a monzogranite rock pile, both of which are commonly seen throughout Joshua Tree National Park in Southern California. Moderate temperatures and blooming trees make spring the perfect time to experience this desert oasis. Image is courtesy of Boris D.
After a brown, dry winter, 2007 may not be the best year to spot wildflowers at Joshua Tree National Park. But don't let that stop you from making plans to head out to the park. The park's geology, while changing, is not quite as ephemeral or picky as those springtime flowers. More than 3,000 square kilometers of geologically and ecologically unique land were designated as a national park in 1994, an upgrade in status after 58 years as a national monument. Today, the desert oasis holds few reminders that just 225 kilometers to the west, commuters are likely hostage to a Los Angeles traffic jam. So this spring, leave the cars and smog behind, and head out to where the Mojave and Colorado deserts come together with the Little San Bernardino Mountains to produce some spectacular sights. If coming from afar, you can fly either into Los Angeles International Airport and drive about 2.5 hours east to the west entrance at the Oasis Visitor Center, or fly to the closest airport at Palm Springs, which is a short drive from the park's entrance. Alternatively, you can enter the park from the north and south sides at Twentynine Palms and Cottonwood Spring, respectively. If you prefer lodging over camping, any of these cities would be the place to find a room. Otherwise, if a tent or camper van is more your style, these towns offer your last chance to stock up on firewood and supplies before heading into the park. Once settled, head out and explore. The Skull Rock nature walk offers a moderate, 2.4-kilometer-long loop that passes by some of the park's well-known rock piles. Start the walk at the Jumbo Rocks Campground, where you will immediately see examples of such structures, which attract rock climbers from all over. The rock piles are the result of millions of years of weathering and erosion processes that began when the region was wetter and cooler. First, columns of rock called monzogranite formed when the Earth's crust was taking shape and cooling. Next, erosion formed fractures, or joints, in the monzogranite. Water eventually worked into the joints, changing some of the hard rock into soft clay. Finally, a changing climate brought flash floods that swept away the clay, leaving behind the rounded towers of monzogranite seen today. Skull rock is just one example of a rock pile, artfully shaped by these erosion processes until it resembled a human skull. 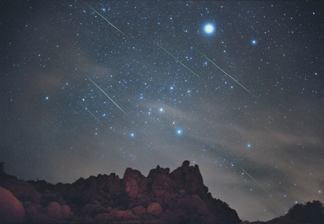 Meteors blaze across the sky above Joshua Tree National Park as part of the 2001 Leonid meteor shower. Dark skies make this park the perfect location for stargazing. © Wally Pacholka/ AstroPics.com. If you're looking to cover more ground in less time than walking, however, bring the mountain bikes along. Joshua Tree National Park has set aside 47 kilometers of trails for mountain biking, although approval of that use hinges on a decision by Congress, according to the National Park Service. Check the National Park Service Web site for updates on trail availability. In the meantime, try riding (or driving) the 29-kilometer-long self-guided tour along Geology Tour Road. Pick up a brochure from a ranger station (or print one out from digital-desert.com) for descriptions of 16 points of interest. Stop 12, for example, points out mines on the hillside, where a century ago, miners worked to extract gold, silver, copper and lead. Stop 10 shows a visible example of the region's numerous faults. Here, you can see how the 80-kilometer-long Blue Cut fault led land on the northward side to be uplifted to form the Hexie Mountains, while land south of the fault was depressed to form Pleasant Valley. Hundreds of faults span the park, however, which is bordered on the south by the well-known San Andreas fault. The faults are responsible for trapping the water that makes up the region's natural springs, which feed the park's five oases. After a long day of hiking, biking, climbing or strolling, head back to camp to partake in an evening of stargazing. Away from the pollution of city lights, the dark is flooded with stars, planets and other celestial objects. Look for the Milky Way, satellites or even a meteor shooting across the sky. If you want to learn more about the night sky, consider attending one of the monthly star parties at the park hosted by the Andromeda Astronomical Society. March is the end of the busy season at the park, according to Frommers.com, when most people flock to see the wildflowers. Spring also boasts comfortable temperatures, with highs at about 85 degrees Fahrenheit, and lows at about 50 degrees Fahrenheit. Despite a lack of wildflowers this year, the park's namesake won't let you down: two Joshua Trees in the park known to have buds started to bloom earlier this month. So hurry  Joshua trees typically only bloom until late April, and not every year.